Epilobium coloratum plant in bloom. commons.wikimedia.org (Accessed 5/2018). 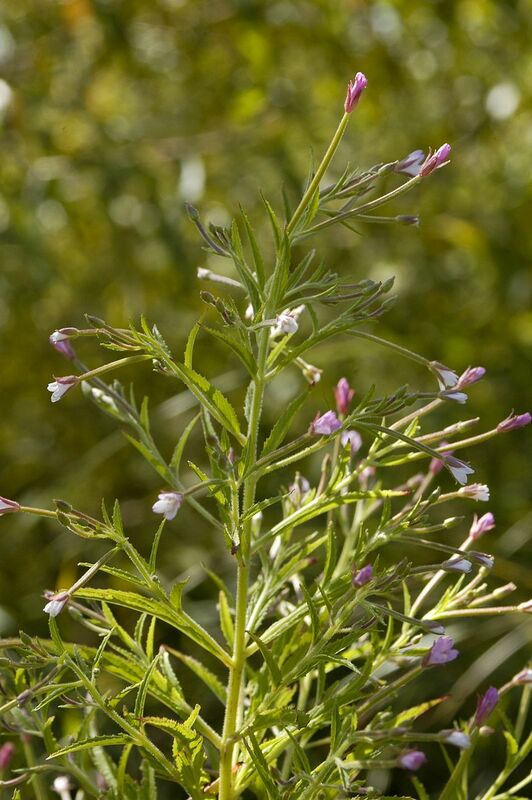 Epilobium coloratum is a perennial herb to 1 m tall (usually shorter), from overwintering rosettes, stem freely branching, often reddish at nodes (Yatskievych 2006). Leaves opposite, short-stalked, blade lance-shaped, 4-1.5 cm long, 0.5-2.5 cm wide, often reddish, tip long-pointed (acuminate), base usually rounded, margin closely, veins impressed above, shallowly toothed; winter rosette of small, light green, toothed, elliptic leaves. Epilobium coloratum flower and young fruit. David G. Smith. Delaware Wildflowers. delawarewildflowers.org (Accessed 5/018). 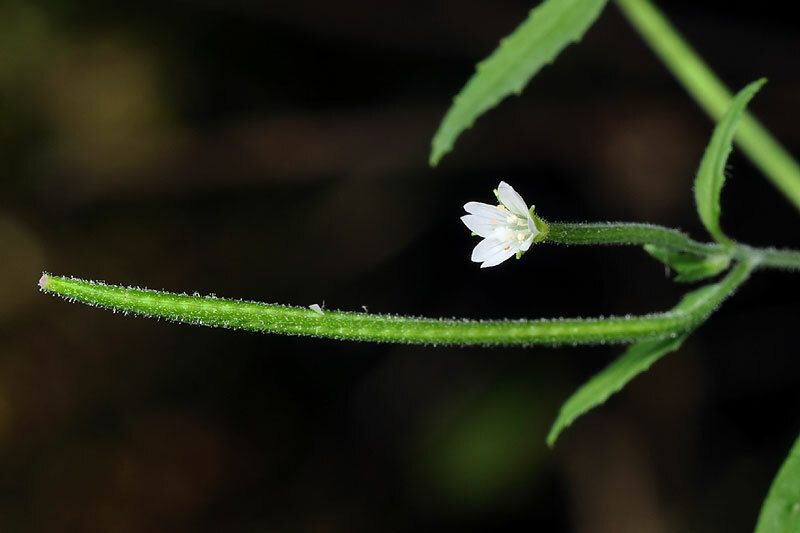 Flowers pinkish-white, 4-parted, radially symmetrical, petals 0.3-0.5 cm long, 0.2-0.3 cm wide, calyx lobes alternating with petals, stamens 8 pinkish, stigma rounded, white, ovary inferior, elongate, linear; inflorescence much branched, with leafy bracts, reduced upward, flowers numerous, closely spaced; blooms July-Oct.
Epilobium coloratum.old fruit hulls.copyright David G.Smith.1.2012.Delaware Wild Flowers.delawarewildflowers.org (Accessed 1/2017). 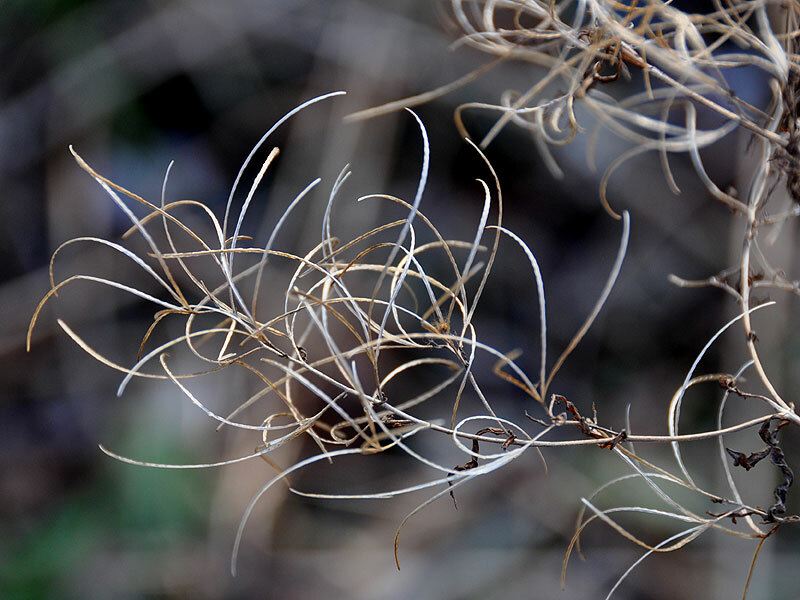 Fruit becoming dry, linear, 3-6 cm long, 0.1 cm wide, 4-valved; valves curling back to release numerous black seeds 0.2 cm long, each plumed with red-brown hairs; wind-dispersed through fall, into winter. Habitat: Open, wet edges, marshes, swamp forest edges; soil pH 4.5-7.5. Tolerant of partial shade. Intolerant of salt (USDA, NRCS 2006). Notes: Winter plant with numerous, pale tan, fine, curling pod valves.